The design of this custom pond is one of our Backyard Pond Design Examples requiring ample planning due to the large size. The biggest things taken into consideration were the filtration and the flow or circulation of the water in the pond. As a basic guideline we like to make certain that the pond pump turns the water over two times per hour. This pond required a large sand filter. The amount of debris needing to be filtered was just too enormous to rely only on filter pads in the skimmer and at the top of the waterfall. Another option to assist in the filtration is to add a good amount of pond plants to use up the nutrients and starve out the algae. This will help with balancing your backyard pond whether it is a Koi pond, or a simple water garden. A good pond contractor will not only know how to properly install a sand filter but just as importantly will know how and where to place the pickup in the pond for proper circulation. When it comes to circulation of the water to this pond it is important to make certain that there are no areas of stagnant water. Stagnant water leads to algae and that is not a good thing. Once again a qualified licensed pond contractor will look at all of these things when building a pond. Notice on this pond construction not only is there the primary stream/waterfall but there is also a secondary water outlet at the side of the pond used to help in the circulation of the water. Planning in advance for these issues will make the final result of a successful pond that much better. 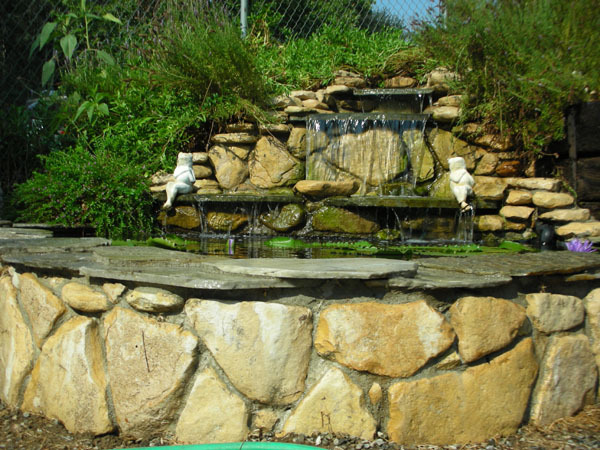 There are so many things to consider when choosing Residential pond builders. It is important to make sure they are a licensed pond contractor.